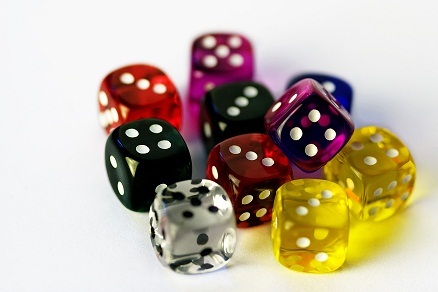 Lean Simulations: Lean Dice Game - Try not to roll them! Lean Dice Game - Try not to roll them! A lean game using dice? Haven't we seen this before? Maybe, but this ones a little different and a little simpler. In fact, it has more in common with the Penny Game than the other dice games I've posted about. Clear dice are best for this dice game. More confusing! I found this lean game on the LitheSpeed blog. LitheSpeed is a consulting company that offers Agile training to software development companies. And so, for obvious reasons this lean game is geared toward the software industry, using terminology like stories and scrum. I like to keep things more general, though. Whether you're in software development or lean manufacturing, these types of training games teach lean fundamentals, applicable to any industry. Concepts like single piece flow, kanban, pull systems and waste elimination are core ideas that transcend specific processes. This game is no different, introducing these key principles in a simple fashion. Most Lean Dice Games fall into the six sigma variety. Rolling dice at each station introduces variability, teaching the importance of stable processes and how to measure variation properly. An important exercise, to be sure, but this dice game is a little different. No dice rolling in this game, just dice turning. That's right. A dice game where you don't roll the dice! The dice are merely there to show the process state. At one process, the operator must turn all the dice so the two is showing. At the next one, the operator must turn it so the three is at the top. And so one. Just like the Penny Game, the main process activity is turning the dice around. Here's the description from the Litheblog. Analysis would be performed by turning a die and placing it on the table such that the number 1 is facing up. Design would be performed by turning a die and placing it on the table such that the number 2 is facing up. Development would be performed by turning a die and placing it on the table such that the number 3 is facing up. And so on, ending with the Product Owner, who turns the dice one more time to accept them. A very simple lean game. Naturally, you're not learning much if you don't go through some different variations. This game is perfect for showing the benefit of small batches. In one iteration, each person must flip all the dice before passing them along to the next person, illustrating large batch production. The next time you run it, you can pass each die after it has been flipped. . .single piece flow. Get someone with a stopwatch to time how long it takes for one die to get through the whole system and compare the different iterations. If one person is struggling and a bottleneck forms, it's time to introduce kanban by limiting the work in process. If you can think of some way to create a bottleneck, even better. That's where the clear dice help out, since it can be harder to see the dots. The blog has a bit more detailed information including how to score and some debriefing points. Head over to the LitheSpeed blog for all the details. If anyone has tried this game, or one similar, let us know. Tell us about your experience in the comments below. 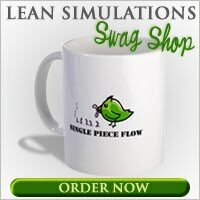 For more lean games, check out my massive list of free lean games and simulations. I just tried out this game with a few changes. 2) no one could move the dices t another station one worker was assigned as a forklift. 4) after 2nd attempt move stream line the workers to be in order. 5) last attempt reduce batch size again. Thanks for telling us about your changes. Games like these work best when people are sitting far apart and other people are designated "material handlers". It shows what a waste forklifts and material movement is. How was the game received by your group? Try introducing a bottle neck by telling station number 4 that the 4 must be facing up and the 1 must be facing away from their body. Using the four makes it difficult to determine simply based on looking down at it what direction the side numbers are pointing. Very tricky. These games work better when there's a bottleneck and using the 4 like that is a great method. Excuse me, I don't understand this game. I think it's because I have a poor english level. Someone have more information on ppt, a video or other.